My Music Recognition uses a powerful audio recognition engine in order to help you get the name of the song you are listening to. It can capture sound from radio streams, the installed music player or any other source and display the name of the song in seconds.Accessibility from the system trayThe application runs silently in the background, without requiring any user interaction. Its options are accesible via the right-click context menu in the system tray, where you can constantly monitor its activity.The menu also enables you to access the complete list of the songs captured so far, which is actually a text file containing all the song names.Fast stream analysis and song name retrievalMy Music Recognition takes advantage of the power of Virtual Audio Capture Grabber in order to record sounds that can be heard from the computer speakers or headphones. In order to do so, it captures a piece of the playing song and proceeds to analyzing lyrics and notes.Once the analysis procedure is completed, a small popup window is displayed next to the system tray, containing the name of the song. 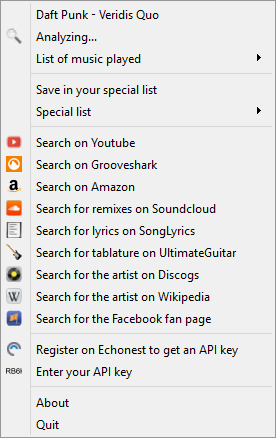 With a single click, you can search for it on YouTube, find remixes on SoundCloud or search for the song lyrics.The right-click menu also offers you options for finding the artist on Discogs and Wikipedia or search for the Facebook fan page, which helps you quickly find out more about the song author and discover the entire discography.Powerful audio recognition softwareMy Music Recognition is an application that can prove useful to any user. With its help, you won't have to wonder around trying to find the name of a song you recently heard on the radio. Just keep it running in the background and you will get the name of the song instantly.